It is with great pleasure that I express my most respectful and greatest appreciation of your exemplary statement promoting the important concept of Ethiopianism in the context of your historical, basic idea of “meddemer”. It is my sincere hope that Your Excellency’s idea for the Ethiopian people’s “meddemer” and focus on Ethiopianism would result in the achievement of the required unity, peace and development in the country. In this connection, I would like to bring to Your Excellency’s kind attention that an entity known as Tibibir (www.tibibir.org) of which I am a member has been attempting to achieve unity among human rights oriented institutions and is in the process of achieving the same among political entities under the leadership of Dr. Erku Yimer and Ato Betru Gebregziabher. 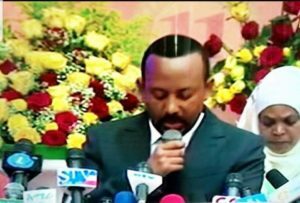 Another admirable achievement by Your Excellency for which you deserve the highest appreciation is your incredible success in facilitating reconciliation and unity among the disparate groups of the Ethiopian Orthodox Tewahedo Church. For Your Excellency’s information, we, the World Association of Parishioners of the Ethiopian Orthodox Tewahedo Church (www.eotcipc.org), of which I was chairman for some years were engaged in the quest of achieving the same objective for over ten years. Our repeated appeals, however, did not get the required result until, thanks to the Almighty, Your Excellency arrived on the scene and was able to achieve the extraordinary result for which I offer my sincere compliments and heartfelt gratitude. One of Your Excellency’s amazing accomplishments is the reconciliation you have been able to achieve with Eritrea within such a short period. In addition, the peaceful relation that Your Excellency has strengthened with the other neighborly Horn of African countries i.e. Djibouti, Somalia, Kenya, Sudan and Southern Sudan has been simply admirable. It is my fervent hope that Your Excellency’s effort would continue and result in the formation of an institutional framework such as a confederation among at least Ethiopia, Eritrea, Djibouti and Somalia to enhance unity and development for mutual benefit. It is also my hope that Your Excellency would find it possible to achieve reconciliation between the Eritrean Government and the opposition. Please permit me to bring to Your Excellency’s kind attention that we had established an entity known as the Horn of Africa Peace and Development Center (www.hafrica.com) of which I was chairman for an initial period followed by a Somali and currently by an Eritrean. This entity had organized international conferences comprising participants from the UN, the USA’s State Department and a number of universities to promote collaborations and unity in the region. It is, therefore, my fervent hope that, as indicated above, Your Excellency would continue with the quest of achieving peace and development among the Horn of African countries which are known to possess great natural resources but need to have the institutional framework for the design of the required vision, objectives, strategy, plan (long, medium and short-term) and program to relieve the 129 million people (226 million by 2050) from poverty and a never-ending tension. Another success story that is attributed to Your Excellency is the sound relationship you are developing with the United Arab Emirates, Sudan, Egypt and Saudi Arabia. It is known that these countries which, in general, are neighbours of the Red Sea have mutually complimentary resources. On the African side, there are rich resources including agricultural, water, mineral and human ones while on the other side of Red Sea, there are substantial oil and financial resources. Therefore, it would be appropriate to consider the possibility of establishing an institutional framework for facilitating an appropriate collaboration among the countries on both sides of the Red Sea. It should not be forgotten that Ethiopia had a historic role in this respect as it used to control Yemen and parts of the current Saudi Arabia including Mecca. I would like to bring to Your Excellency’s attention that I had written an article entitled “Prospects for a Red Sea Cooperative Council” ( http://abbaymedia.info/prospects-of-a-red-sea-cooperative-council-by-kidane-alemayehu/ ) as well as a book entitled: “My Journey with the United Nations and Quest for the Horn of Africa’s Unity and Justice for Ethiopia” in which, among other things, the idea of a collaboration among the countries on both sides of the Red Sea is covered. Your Excellency is aware of the fact that the Fascist Italian Government had committed substantial war crimes on Ethiopia with the Vatican’s complicit support during 1935-41. The war crime had resulted in the massacre of one million Ethiopians including the 30,000 people killed within only three days during February 19-21, 1939 as well as the destruction of 525,000 homes and 2,000 churches and the looting of vast quantities of Ethiopian properties. It is unfortunate that so far Ethiopia has not received the adequate compensation by Italy. The Vatican has also not apologized to the Ethiopian people for its blessing and endorsement of the Italian occupation although it has apologized to the Jewish people as well as the people of Latin America and Rwanda. It has also recognized the Turkish genocide in Armenia. Italy has agreed to compensate Libya which had suffered the massacre of 30,000 people with US$5 Billion. It is also known that Armenia is still fighting for the compensation by US$ 3 Trillion from Turkey and other concerned countries. Although Germany has apologized to Namibia, the latter is demanding a compensation of $3 Billion. The U.K. has apologized to Kenya and is paying compensation while the Netherlands has done the same to Indonesia. It is with regret that I must state the fact that the Ethiopian Government has so far not undertaken its role of demanding justice for the war crimes committed by Italy with the Vatican’s complicit support. It is also important to note that the Association of Ethiopian Patriots as well as the Ethiopian Orthodox Tewahedo Church should exert a special effort in the quest of justice for Ethiopia. In this connection, I should bring to Your Excellency’s attention that the Global Alliance for Justice – The Ethiopian Cause (www.globalallianceforethiopia.org) has been struggling for justice for Ethiopia for over 10 years and I have been the Executive Director with His Highness Prince Ermias as the chairman of the Board of Directors which comprises of Dr. Aklilu Habte, Prof. Getatchew Haile, Dr. Girma Abebe, Dr. Astair Mengesha, Dr. Mikael Wossen, Dr. Jon Levy, Dr. Steve Delamarter, and Mr. Nicola DeMarco. Among the many important measures undertaken by our Alliance so far are the appeals submitted to the Ethiopian and Italian Governments and the Vatican, the governments of USA and UK as well as the EU Parliament, UN and AU. The Alliance’s objection regarding the mausoleum recently established for the war criminal, Rodolfo Graziani, has also resulted in the decision by the Lazio Region as well as an Italian court’s verdict to remove the mausoleum although the concerned city’s leaders who have to face various penalties have appealed against the verdict. Your Excellency is aware that under Colonel Mengistu Hailemariam’s leadership of the Derg Regime, Ethiopia suffered huge crimes including the loss of 500,000 lives including Emperor Haile Selassie I, the EOTC Patriarch, Abune Tewoflos, and 54 senior officials, etc. and the suffering of millions of Ethiopians. It is very sad to note that despite the clear evidence for his crimes, Col. Mengistu is living in luxury in Zimbabwe and is known to have stated that he has not hurt even a fly. Therefore, I appeal to Your Excellency that the Ethiopian Government undertake its role of bringing the criminal Mengistu Hailemariam to justice. I would like to bring to Your Excellency’s kind attention that an entity known as Fiteh LeEthiopia Gibre Hayl (Justice for Ethiopia Task Force) of which I am a member in collaboration with Prof. Getatchew Haile, Ambassador Imru Zelleke, Ato Nesibu Sebhat, Dr. Msmaku Asrat, Ato Tesfamikael Mekonnen, and Ato Tsehay Demeke, has been struggling to bring Col. Mengistu to justice. A letter of appeal was written to Your Excellency and it can be viewed on: http://amharic.abbaymedia.info/archives/45500. Our letter of appeal recommends that the Ethiopian Government take the appropriate action to bring him to Ethiopia for the appropriate justice or, apply the option similar to Chad which collaborated with a neighbouring country i.e. Senegal, to bring Hissen Habre to justice. As stated above, Your Excellency’s emphasis on Ethiopianism has generated a great deal of enthusiasm and support. The expression of “meddemer” as the basic concept is also quite interesting. However, please permit me, Your Excellency, to express my concern that “meddemer” may not be feasible within the framework of an overall arrangement of an overriding ethnic federalism. I must refer specifically to the words that Your Excellency had used in the first speech you had delivered after your assignment as Prime Minister i.e. “hezboch enna beheroch”. Your Excellency has also been elected as chairman of an Oromo entity. The question on my part is whether it would be feasible to establish a united, peaceful and a development oriented Ethiopia in a context where ethnicity is accorded such a level of supremacy. the required peace, unity, vision, a plan and a development strategy in the context of a democratic framework with free elections and respect for human rights in order to relieve the people (current: 109 million; 188 million by 2050) from oppression and the abject poverty they are suffering from. My appeal to Your Excellency is, therefore, to consider the possibility of enhancing Ethiopianism to a level that it would be supreme in the country although cultural difference may also be given due consideration on its level. In this connection, I should state that there are numerous Ethiopians like me who cannot or would not wish to side with any ethnic group because we are of multi-ethnic background not of any particular ethnic group. I am simply proud of being an Ethiopian. Would Your Excellency make this feasible? Similar to other cities in developing countries, Addis Ababa is fraught with low standard settlements lacking in adequate infrastructure and other basic facilities. As Addis Ababa is Ethiopia’s as well as Africa’s capital city, it is incumbent on the Government to undertake the maximum effort so that the city would reflect the meaning of its name: New Flower. I was delighted to hear you state the same objective in your recent statement, a wish I had for several years due to my 15-year experience under UN auspices as an advisor to Dubai Municipality. The outcome of the UN effort in Dubai is reflected in my above mentioned book which was submitted to your protocol officer and the Ethiopian Embassy in Washington, DC during your recent visit to USA. I suggest, Your Excellency, that you kindly invite the UNDP to deploy a one-month consultancy to be undertaken by a Strategic Development (not a mere master plan) expert through UNCHS (United Nations Center for Human Settlements/Habitat) to formulate a project to be implemented by UNCHS in close collaboration with the concerned Government organization. Please permit me, Your Excellency, to express again my heartfelt appreciation and thanks for the many important and positive achievements you have gained so early in your leadership. I also request Your Excellency to give due consideration to my points of appeal submitted above.